‘But I don’t do this of course,’ the student who raised the point said, looking – dare I say it – a tad bit guilty. I looked around the rest of the class. They all looked equally guilty. None of them objected to the point that was raised: that they would be seriously less stressed if they started on time with everything they had to do. Everyone also agreed that being less stressed and doing less rushing would be a good thing. Yet somehow they’d all become convinced of the fact that starting on time with working on their projects was an impossible feat; so impossible that they might as well give up trying. Procrastination, my students seemed to say, is simply part and parcel of student life. It’s unavoidable, like bad weather. And here’s the thing: I understand where they’re coming from. When I was a student myself I was seriously good at procrastination. I was so good at it that I once spent six months without attending a single lecture or working on a single assignment (yes, you could still do that when I was a student without immediately getting kicked out). And when I did finally decide to put in the hours? Well, then I only got serious about it at the very last moment. I really needed the rush of being close to a deadline to get serious about whatever task was at hand. That meant I spent long periods doing almost nothing, followed by short periods of very intense stress and panic. I think it's safe to say that I paid a heavy price for that strategy – I frequently exhausted myself because I had to pull all-nighters or because there was not enough time to take breaks. Yet it never dawned on me that I should change my strategy. 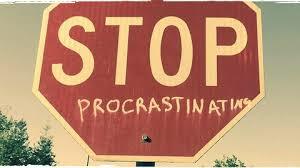 For me, like my students, procrastination was something that I considered a fact of life, something I simply accepted. It was just how things were. But is that really true? Is starting on time really something that’s impossible to do? I’ve thought a lot about that question in recent years, and have become convinced that it isn’t – there are ways of working that help us to almost completely eradicate procrastination from our lives. But why is doing that so hard? Why do so many of us procrastinate – even if it seriously affects the quality of our life? In this blog post I’ll write out my thoughts on these questions, and explain why I think we procrastinate - along with some suggestions for how we might change this behavior. Reason #1: We procrastinate because we are overwhelmed. The number one reason why I think we procrastinate is because human beings have an inborn tendency to avoid pain. And the bigger a project, the longer our to-do list, the more intense the pressure we are under, the more the things we have to do become associated with pain. So we go into hiding. We pretend the project, the to-do list, the pressure – whatever feels too painful - isn’t there. We put it off until tomorrow. ‘I’ll relax right now’, we tell ourselves. ‘But tomorrow – then I’ll start on my big scary 5000 word paper’. The only problem is that we don’t. Because tomorrow that paper still feels equally scary. And the day after that? Same thing. It becomes the thing we don’t want to look at. Somehow, I’ve come to realize, human beings are really good at convincing themselves that not thinking about something is a good idea. And sometimes it is. Fact of the matter is, though, that often it isn’t. So how to handle this perfectly natural tendency of the human mind? One of the best ways I’ve discovered along the path of trying to overcome my own procrastination tendencies is to use the power of habit. Facing the things that are painful in life, that are a little scary, takes a great deal of will-power. Sometimes things are so scary and painful that we simply cannot muster up that will-power, and then we’ve lost the battle. We retreat and go into our comfort zone, whatever that may be (looking at random videos on youtube, checking facebook – pick your poison). But here’s something that not many people realize: there’s a way to face what is scary and painful that does not require tons of will-power, and that is by using the power of habit. Develop a daily routine – a habit, in other words - that makes looking at that scary to-do list or thinking about how to tackle that difficult project something that is simply built into what you do every day. Using the power of habit has been the number one breakthrough that has helped me to reduce procrastination to manageable levels. My own way of working – as described in my short time management book for students (or anyone else with a busy life) Make Lists Not Fists – centers heavily on doing what I call in my book the 'morning ritual', a morning routine which involves cleaning up my to-do lists, looking at all my deadlines, and then creating a to-do list for that specific day. I do that every single morning of every single work day. Because it’s a habit it requires zero will power. Not a single cell in my body protests that I do this. I don’t have to think about it – I boot up the computer, grab a cup of coffee, and complete my morning ritual. After I’m done, I’ve looked at all my scary deadlines, and I’ve decided when and how I’m going to work on them. Now that I’ve got that helicopter view of everything that’s asking for my attention, I’m way less intimidated, and it’s much, much easier to muster up the motivation to do the actual work. Reason #2: We procrastinate because we try to do too much in one go. With really big projects, therefore, don’t tell yourself something generic like ‘I’m going to write my paper now’, without a time limitation and without a task specification. To the part of you that wants to avoid pain and suffering (in most of us a highly influential part 😀) that sounds like a terrible ordeal. But if you add a time limitation, as well as a precise task specification, it feels much lighter. ‘I’m going to write the introduction of my paper for 45 minutes, and then I’m going to take a short break’ – that sounds doable. Which means you’re much more likely to actually go out and do it. Work like that over a sustained period of time – a series of days, let’s say – and guess what? You have your paper. Chances are the paper is better, too – because you’ve had plenty of time to come up with fresh creative ideas in between each writing session. This method, however, only works if you start on time – which you’ll probably only be able to do if you use the power of habit mentioned in point one above. Reason #3: We procrastinate because we think we have to feel motivated before we start working. Don’t wait until you feel like doing something. When you’re mired in negative emotions about work, resist the urge to try to stamp them out. Instead, get a little distance — step away from your desk, focus on your breath for a few seconds — and then just feel the negativity, without trying to banish it. Then take action alongside the emotion. Many of my students have told me that just reading that passage in the book changed their whole perspective on procrastination. It’s a radical but overwhelmingly simple thought: what if you could just start? What if you didn’t have to wait until you ‘feel’ like starting? It’s on this simple premiss that Morita Therapy is based, and it’s one that I wholeheartedly subscribe to. I try to put it into practice regularly. And guess what? If you use the power of habit, andyou chop big tasks up into a series of smaller tasks, it’s much easier to just get started, regardless of how you feel. Reason #4: We procrastinate because we don’t realize fully that we pay a high price for doing so. That strikes me as a very sensible point indeed. When we decide on how to act, we need to take the whole of our life into account - not just the present moment. If we focus on the present moment only - which we do when we procrastinate - there will at some point be a price to pay. It may take a while before the payment is due, but it will need to be paid at some point - no exceptions. Becoming conscious of that price - for example by watching Peterson's lecture on the topic - may therefore be an effective strategy to help battle our tendencies to procrastinate. Afterthought #1: Is all procrastination bad? Answer: no, it isn’t. A little bit of procrastination, when used wisely and in moderation, is probably healthy. Sticking to a strict regiment of tasks with military precision and without any small acts of procrastination is killing for the parts of you that are creative and playful, and you desperately want those parts on board if you want life to be fun and rewarding. But procrastinate wisely. Keep an eye on the clock. Don’t get lost in it – procrastinating for hours on end is probably one of the worst feelings you can have as a human being (and we’ve all been there 😀). Give yourself permission to procrastinate, but do so only when you can really afford to. Also, consider putting a time limit on your procrastination sessions. Doing things that are fun but relatively meaningless can be great, but doing so for hours on end? Most of the time, the feeling that leaves you with is suboptimal to say the least. It’s certainly possible to reduce procrastination to almost zero levels, then – to that I can testify. But will doing that automatically mean you will no longer be rushing, so that you’ll end up living the life of tranquility and peace which the Daoists advocate? Probably not. Not procrastinating simply means that you are not spending your time on useless activities during time periods when you really can’t afford doing. Doing that doesn’t automatically turn you into the Western equivalent of a Zen monk. In order to make sure that ‘no procrastination’ also leads to ‘no rushing’, you need to take one more step: leave some space in your day. Don’t plan it chock-a-block full with useful activities. Start on time with your projects, but use the time that this frees up to leave some breathing room in your schedule. Do that consistently, and perhaps at some point you’ll reduce your stress levels to such an extent that you can proudly call yourself a Western Daoist. Afterthought #2: Sometimes procrastination is telling you to change direction. Here’s a final thought: if none of the advice given in this blog post works for you (after getting serious about it for a sustained period of time – you’ll need some time to learn new habits and clean up your act) you might need to think about whether what you’re trying to achieve is really what you ought to be doing with your life. Sometimes the fact that we cannot muster the motivation to do something simply means that it isn’t something we really ought to be doing anyway. If you hate every single minute you spend doing something, then maybe it simply means that there are more worthwhile pursuits to consider. That’s also very much a Daoist idea: that every person has their own inner nature, which means that each and everyone of us will flourish in some circumstances and do poorly in other circumstances. As Benjamin Hoff puts it in his excellent Tao of Pooh: “When you know and respect your Inner Nature, you know where you belong. You also know where you don't belong.” And that’s very good advice. The problem is that it’s quite difficult to tell the difference between where you belong and where you don't belong sometimes. The fact that you're procrastinating a lot doesn't have to mean that what you're doing is not right for you. Most of the time, I think, it’s just a sign that you need to get organized and clean up your life. So try that first. Working in the right way has a tendency to change the feel and quality of almost every single thing you do into something more enjoyable. If you’ve tried that, though, and you still hate what you do, consider changing direction. If your tail is dragging, check your path. If you enjoyed this post and want to help others discover it, please consider liking it on facebook . Dr. Ritske Rensma teaches philosophy and religious studies at University College Roosevelt, where he also gives regular workshops on research skills and productivity as part of the UCR Study Skills Center. 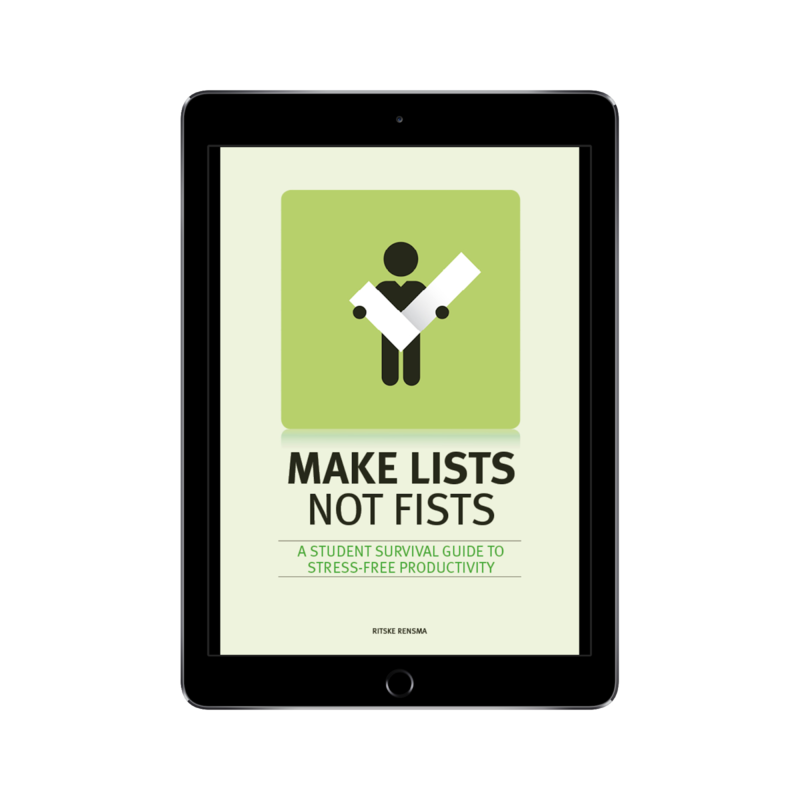 He is the author of Make Lists Not Fists: A Student Survival Guide to Stress-Free Productivity. If you'd like to be updated about future blog posts, like Make Lists Not Fists on facebook. "Should you do what you love?"